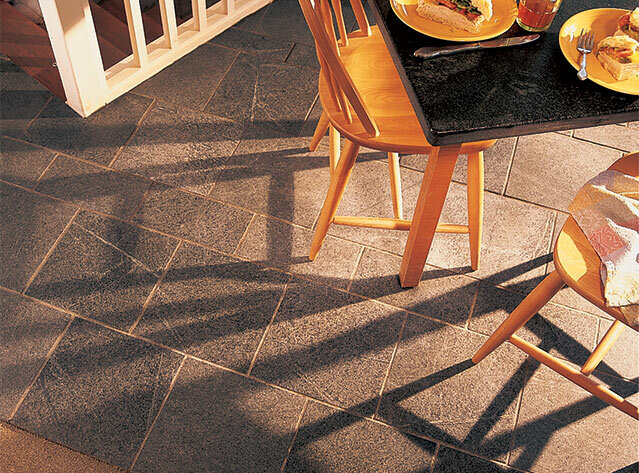 Soapstone is a natural product quarried from the ground in blocks, like marble and granite. But unlike either of these stones, it’s non-porous, which makes it completely stain resistant. Soapstone is an inert material and impervious to chemicals, acids and heat — so there are no household products that will harm it. It’s durable like granite and marble, but it’s more forgiving under stress, soapstone has a tendency to dent rather than chip or crack. Soapstone is recognized by the US Food and Drug Administration (FDA) as a suitable surface material for contact with food. Soapstone fresh from the quarry is light gray in color. 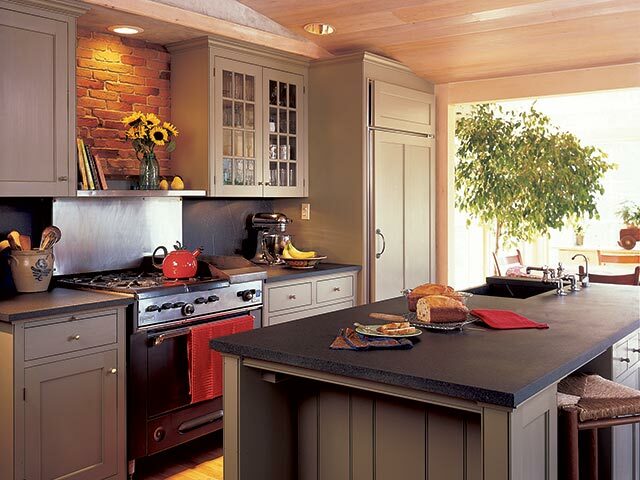 That rich charcoal color soapstone is known for comes when the stone is exposed to water, grease and oils. These liquids cause the stone to oxidize, which darkens the stone’s color and really brings out its natural beauty. To help expedite oxidation of the stone, we recommend that you treat it with mineral oil from time to time. This treatment will keep oxidation uniform across the entire surface. Once your soapstone is installed and enough time has passed for glues to set up properly (overnight), it’s time to bring out the natural beauty of the stone with mineral oil. Newly installed stone will have some dust residue, which easily wipes away with a sponge and clean water. When all the dust is gone, your soapstone is ready for its first coat of mineral oil. The first oiling of your soapstone will take a bit more elbow grease than follow-up oilings. With a few clean, dry rags at the ready, simply pour the mineral oil directly from the bottle onto the surface of the soapstone, rubbing it on to the entire surface with one of the rags (a small paint brush can be handy for corners). Once you’ve covered the stone with oil, let it sit for a half hour or so. Then just wipe off the excess oil with another clean, dry rag. Remember, mineral oil is just a thin moisture layer that is used to speed up oxidation of the stone. Since the stone doesn’t absorb the oil, over time it will evaporate and need replenishment. 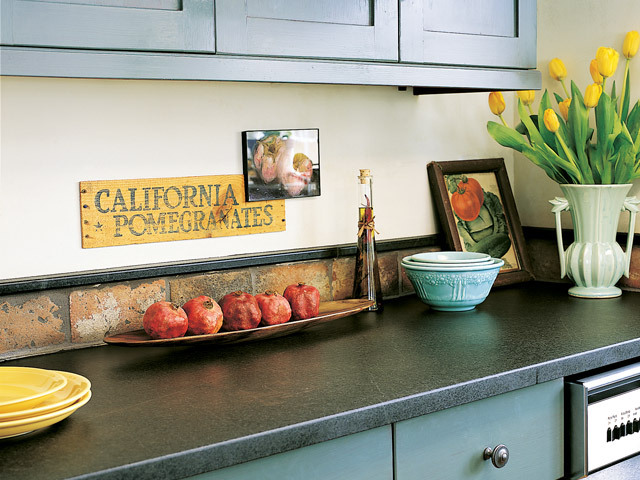 Now that you have brought out the character of your soapstone, it’s ready to use. This treatment and its frequency of application depends on the individual homeowner. Most people find an average of once a month for a year works for them. Some are finished with treatment within a couple of months. Some people treat the surface for a couple of years. A general guide to reapplying the mineral oil is, when water is leaving a noticeable dark spot, oil it up. We’ve had a longstanding debate around here over the oiling of a soapstone sink. When the oil is applied, the sink looks great. But, with the use of dish detergents, often the oil is removed after a few washings. That said, we leave the oiling up to you. The sink will darken with age and use, anyway. 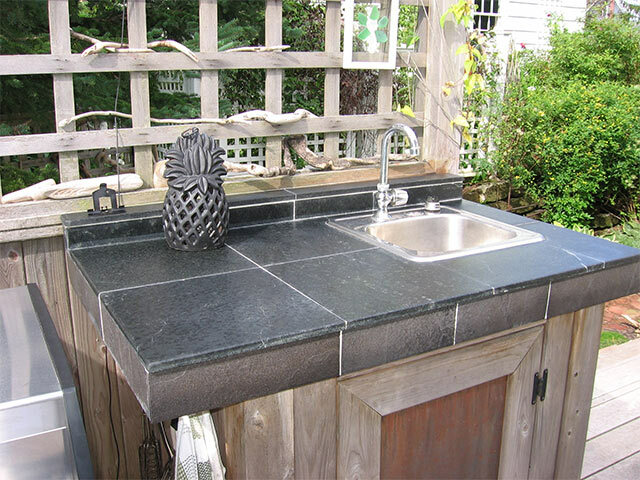 You can clean your soapstone after the mineral oil treatment using any household cleanser such as Ajax or Comet. Usually just wiping the soapstone with soap and water works just fine. 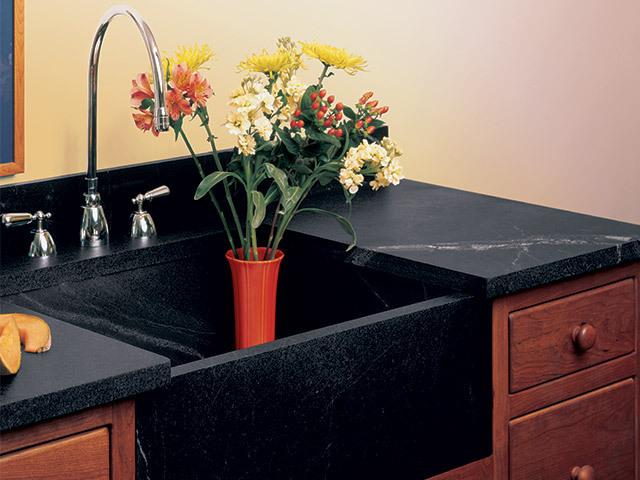 A soapstone sink will stand up to any mild cleaner. Sink corners can be easily kept clean with the use of a small vegetable brush when needed. Without a doubt, soapstone loves to be used. In fact, we’ve found that the more the stone is used, the less often you need to do follow-up oiling. If you see scratches early on, they are usually just a displacement of mineral oil. Gently rubbing the area with your thumb, or just reapplying a small amount of oil, will eliminate the mark. We’ve used and promoted the application of mineral oil for the past 50-60 years, and we’re comfortable with its performance on soapstone surfaces. In the last 5 years, a few manufacturers have brought wax alternatives for mineral oil to the market. We have tested a few of these and have asked our customers to try them also, and we have gotten positive feedback. 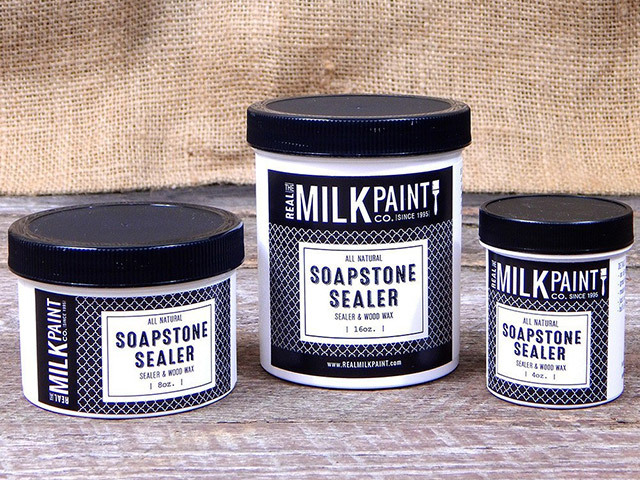 We have decided to make available Soapstone Sealer from The Real Milk Paint Company. We are mineral oil advocates based on our long experience, but we offer the wax as an alternative for customers who prefer it. We’ll be more inclined to recommend it strongly after a few years of field testing. We’d love to hear your opinion after trying it yourself. Soapstone Sealer is available in 4 oz. ($20.74) and 8 oz. ($33.49) sizes, with coverage at 50 sq. ft./4 oz. Shipping is free. As we have been since 1856, we’ll be here to assist you — or your grandchildren — with any soapstone care questions they may have.